Historic, Medieval Madrid is the heart (and capital) of Spain. Others go to Barcelona for their beaches and cosmopolitan, international scene. Me, I prefer Madrid. It’s easier to find the true feel of the city and its residents. You’re challenged more often to speak the language and adapt to their customs. And the museums are amazing. While in Spain this summer, I made sure to take a weekend in Madrid. I wish I had had longer! 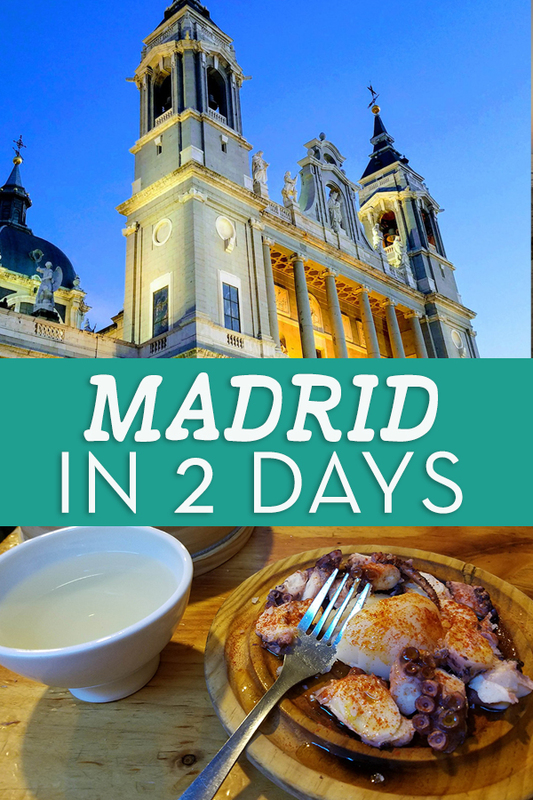 Here’s what I experienced and my suggestions on what to do in 2 days in Madrid. So. Much. Ham and Cheese. In Madrid. Coming from Granada, I had booked a 28 Euro ticket on the one of Spain’s national bus lines, Alsa, online in advance. There was no direct train from Granada to Madrid, and the flights were very expensive, so bus it was! There was the option of pre-paying for a cab to take me to my address for 5 Euros. Traveling with heavy luggage, it seemed worth it to me, so I added it on. Big mistake. Fast forward to me wandering the Madrid bus station for an information desk until eventually finding the Alsa ticket counter. Between my broken Spanish and the agent’s broken English (and my phone’s google translate!) we were able to work through the issue. However, while this was a valid offer that they had, it was not one they were prepared to actually deliver on. Eventually what seemed like a supervisor took me in a company car to my airbnb. Clearly I should have just taken a cab - there were plenty nearby! A quick note on the language barrier: One difference you’ll find between Madrid and Barcelona is that in Madrid it’s far less likely that your cab driver or waiter will speak English. It’s a city that caters to more Spaniards than tourists. They will expect you to speak Spanish more often. Translation apps can be lifesavers! I stayed in the Cortes quarter, convenient to grocery stores, restaurants, and museums. Central Madrid is quite small and easy to walk around. I didn’t end up needing the subway for any of my touristing adventures, as it was all walkable distance. A lot of the sidewalks are cobblestones, however, so make sure to bring comfortable shoes!! Also, while I didn’t encounter as many steps as my Granada trip, there were still quite a few getting into and out of my airbnb (and I booked on the ground floor!! Why so many steps, Spain?) and at a lot of the restaurants and cafes I went into. Madrid will be difficult for those with limited mobility. Or for those of us with recent back injuries and an overly-heavy suitcase! Later that day, I made my way on foot to the Plaza España to join up with Native Spanish tapas and history tour that I had booked in advance for $65 USD. I’m a big fan of starting off city trips with a food tour. You’ll get a feel for the neighborhoods, learn about any local customs or practices when it comes to ordering and eating, and also have a delicious meal in the process! This tour did not disappoint on all three fronts. While it was much longer, and with much more walking, than I anticipated, we got a thorough tour of central Madrid in 4 hours. Suckling pigs in the kitchen at Sobrino de Botin, established in 1725. Tapas are free in Madrid when you’re ordering drinks at pubs and cafes! Unlike Spaniards from Catalunya, Madrid still proudly hosts bullfighting and will likely continue to do so for years. Madrid residents, according to our host Rafa, also look down on the Catalan Independence Movement. Having just been in Barcelona to see the number of Catalan flags flying… I held my tongue. The late eating time is no joke. We ended our tour around 9:30 at Casa Nicasio, by the Madrid Opera House, for dinner. Dinner lasted about 2 hours with multiple courses. Spain loves their jamon and queso. It might be a struggle to be a vegan while there. As I walked home at 11:30, restaurants and cafes were packed with patrons still eating their dinner. I started the day in the massive, popular Retiro Park. Imagine a hybrid of Hyde Park, Kew Gardens, and New York’s Central Park, where both madrileños and tourists wander in the lanes and relax by the massive ponds. The two English parks may have come to mind due to Retiro having its very own Crystal Palace. This one is completely empty inside, but free to enter and to marvel at the glass and iron structure. Otherwise it’s a pleasant park, and a good way to find greenspace in an otherwise packed city. If you’re in a hurry, however, it’s not a must-see. Madrid has several well-known art museums, the largest of which have free hours. I was there on a Sunday, where the Reina Sofia museum is free from 1:30pm-7pm, with the caveat that not all galleries are open during those hours. The open galleries include works done from 1900-1945, including work from Picasso, Dalí, and Miró. They’re arranged chronologically, so you can see the influence the tumult of those early decades (aka Civil War) had on the artists. I got there at 1:35pm, thinking I would get in on the early side. There was an impressively long line, but it only took about 20 minutes to enter. Had I come an hour later, I wouldn’t have had to wait at all. However, the galleries were noticeably more full the longer I was there, so that’s the trade-off. The Reina Sofia is most well-known for housing Picasso’s Guernica, which takes up a full room and will have the most crowds anywhere in the museum. Please note that you cannot take photos of the Guernica, or even in the room - there are very alert guards! As to whether it was worth it - Absolutely! While the room was crowded, the Guernica, a depiction of a bombing during the Civil War, still had an affect on me as a powerful piece of protest art. Also check out the work of a few lesser-known female artists whose work is on display, include Rosario de Velasco and Angeles Santos. I stopped for a lengthy late lunch at El Azul, a small cafe a short walk away. I had been in Spain for ten days at this point, and this cafe was the first place I had been able to order my preferred unsweetened ice tea. I could have stayed at this cafe until it closed, just sucking down the beautifully cold bitter tea without any saccharine-sweet sugar. The food was fresh, and it was nice to have a meal that did not include jamon or queso. I didn’t think it was possible, but after a couple of weeks in Spain, I had started growing weary of those two staples. Next it was time for museum #2: The Prado. The Prado was the museum I had heard of prior to researching my trip. It’s older and much larger than the Reina Sofia. It houses artwork from the classical period up until the early 19th century, including extensive collections by Goya and El Greco. It’s free from 5-7pm on Sundays (6-8pm during the week). I, again, went in the early part of window and spent another 20 minutes in line to get it. However, given their shorter hours, this would be much more of a trade-off to go later. While the work on display here is not as much my cup of tea, the sheer amount of it is absolutely astounding and definitely worth a visit. If you’re not passionate about classical and medieval art, try to aim to go during the free hours. There is a fun game at the Prado for history nerds like myself. The Hapsburg royal dynasty ruled Spain for 200 years. In that time, amongst their many achievements was a penchant for… well, keeping it in the family. You can go down a google rabbit hole seeing how this inbreeding lead to the dynasty’s downfall. There’s a distinctive jaw that carried through the generations. In addition to the other artworks at the Prada, it houses hundred of royal portraits. The game - follow the Hapsburg chin through history! Men, women, down to poor Charles II who had trouble eating his food. Sadly the guards found it less amusing, and asked me to stop taking photos. It was fairly empty when I sat down for dinner at 8pm at Taberna Maceira, a Galician seafood restaurant. This was good, as I hadn’t made a reservation and could get right in. If you go later, a reservation is required. Also, at 8pm the waitress could take her time walking me through the menu with my limited Spanish. The food was delicious! There are multiple locations of this restaurant within Madrid, and I recommend hitting it up wherever you find it. I filled myself up to the point that I took a long walk through the historic, beautiful cobblestone streets after dinner. Again, at 11:30, the streets were bustling and I didn’t feel unsafe at all.